Rotor post seals seal around the inner post on both the hot and cold ends of the rotors. It is recommended to replace them with the radial seals due to the ease of accessibility. Thermal growth and sector plate locations must be taken into consideration before and during installation. Radial static seals are mounted on the radial sector plates and prevent air/gas from leaking behind the plates. On axial type air heaters, these seals are usually a slip type. 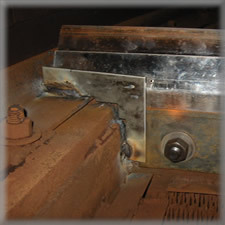 This allows the plates to be adjusted or moved as necessary depending on the type and location. 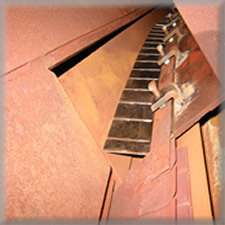 Non-axial types are typically 12 Ga Corten & welded. Axial static seals are found on axial-type units only. They are mounted on the axial plates and prevent air/gas from leaking behind the plates. Axial static seals are typically a slip type that allows the Axial seal plate to be adjusted as necessary. 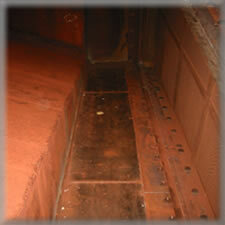 Bypass static seals are the most inaccessible seals in an air heater and are often overlooked. They are installed in axial type units only and are mounted directly behind the axial seal plates. 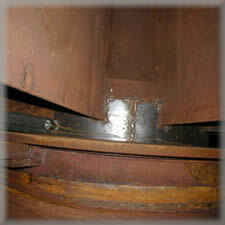 They prevent air/gas from flowing between the seal plates and the ductwork. 1/2" cap screw or cup pt. is typical but hardware varies. 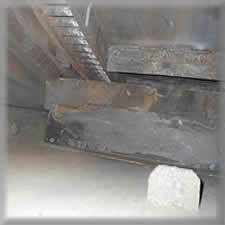 Seal tabs are found in many different locations in the various types of air heaters. They are used anywhere air/gas is bypassing seals, elements, rotor, structures, etc.